Theodoropoulou, M.C., Elefsinioti, A.L., Bagos, P.G., Spyropoulos, I.C. G-proteins act as switches for signal transduction from extracellular space into the cell. This is accomplished through their interaction with G-Protein Coupled Receptors (GPCRs). G-proteins form hetero-trimers composed of Gα, Gβ and Gγ subunits, and they also possess a binding site for a nucleotide (GTP or GDP). G-proteins are named after their α-subunits, which on the basis of their amino acid similarity and function are grouped into four families (Gαs, Gαi/o, Gαq, Gα12). GPCRs form the major group of receptors in eukaryotes and they possess seven transmembrane α-helical domains. GPCRs are usually classified into several classes, according to the sequence similarity shared by the members of each class.Class A of GPCRs (rhodopsin-like GPCRs) contains the majority of GPCRs, including receptors for structurally diverse ligands (biogenic amines, nucleotides, peptides, glycoprotein hormones etc). Class B (secretin-like GPCRs) contains purely peptide receptors, whereas class C (metabotropic glutamate family receptors) contains metabotropic glutamate and GABA-B receptors and some taste receptors. Class D contains the fungal pheromone receptors, class E contains the cAMP receptors of Dictyostelium and last is the Frizzled/Smoothened class. 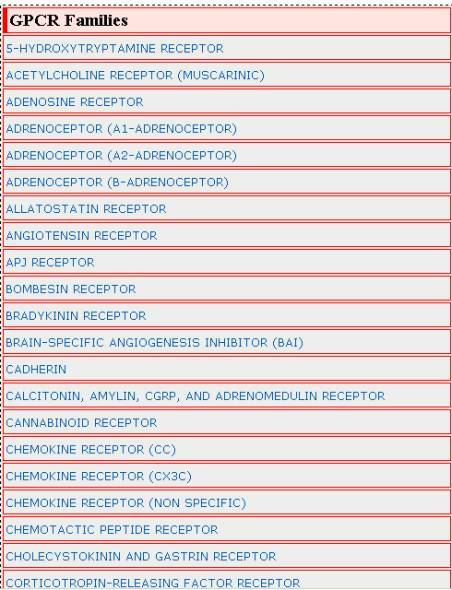 There is also a number of putative classes of newly discovered GPCRs, whose nomenclature has not been accepted yet from the scientific community. The stimulation of GPCRs leads to the activation of G-proteins, which dissociate into Galpha and Gbeta-gamma subunits. The subunits then activate several effector molecules that lead to many kinds of cellular and physiological responses. Effectors form a diverse group of proteins, that, throught their interaction with G-proteins, either act as second messengers, or lead directly to a cellular and physiological response. Effectors have never being classified before. We classified them into families, subfamilies and types, based on their function. The annotation regarding the interaction between GPCRs, G-proteins and effectors and the effect of the particular interaction was a result of an exhaustive and detailed literature search. We collected the available information from review articles and original research papers, which we provide as links in each entry page. A point that it was impossible to be explained in the manuscript (and thus is discussed in the online manual pages) is the fact that no entries are included in the database solely using a prediction system. On the contrary, interactions are inferred from orthologues. In particular, when we have a particular reference stating that protein X interacts with protein Y in organism Z, we search all the other closely related organisms for such pairs (X-Y). This search is not being performed on an automated fashion (i.e. a simple BLAST search) but instead we rely on family classification (from PFAM), the gene name, the function of the proteins etc. we conclude that Gbeta-gamma dimer inhibits Adenylyl Cyclase I, and thus this information could be transferred to all the available (mostly mammalian) organisms possessing Gbeta-gamma and ACI. we conclude that Galpha-16 interacts with TRP1 and this information could be expanded to all organisms possessing Galpha-16 and TRP1. And similarly we proceed with the other interactions. we conclude that AT2 receptor interacts with Galpha-I and this information could be transferred to all organisms possessing AT2 receptor and Galpha-i. we conclude that TA1 receptor couples with Galpha-s and this information could be expanded to all organisms possessing TA1 and Galpha-s.
Of course, there are other more “simple” and straightforward situations such as the interactions of Galpha-s subunits that are known for years to stimulate adenylate cyclases, and so on. This way, although someone could argue that some of these entries should be marked “by similarity” we feel that we should not use such discrimination in the annotation of the database entries. Each family is further subdivided into different subfamilies, based mainly on TIPS classification scheme that takes into account the native ligand(s) that binds to a particular GPCR . 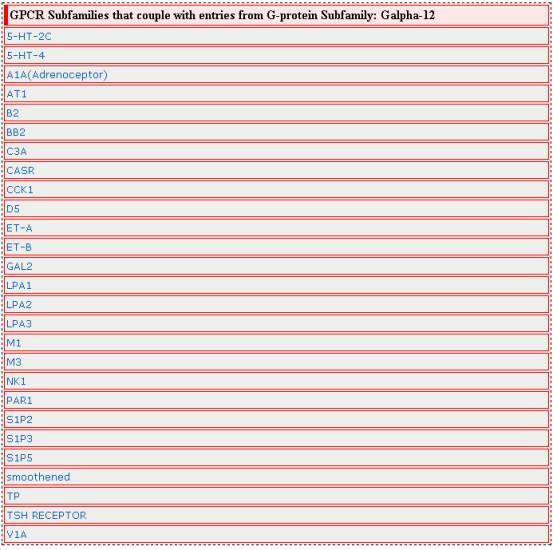 The GPCR SUBFAMILIES MENU enables the user to either view the individual receptors of the specific subfamily or to view the coupling specificity of the GPCR subfamily with G-protein subfamilies. As it is shown in the picture of the GPCR subfamilies the user has the alternative to click on the arrow button instead of selecting to click on a specific subfamily. 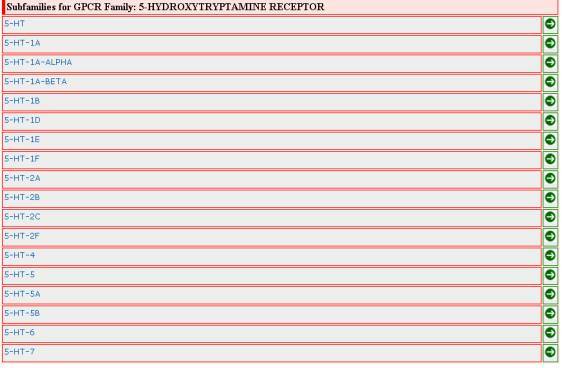 The user then is presented with a list of G-protein subfamilies that couple to the specific GPCR subfamily. The G-protein types of these subfamilies have known coupling specificity to the receptors of this specific GPCR subfamily. 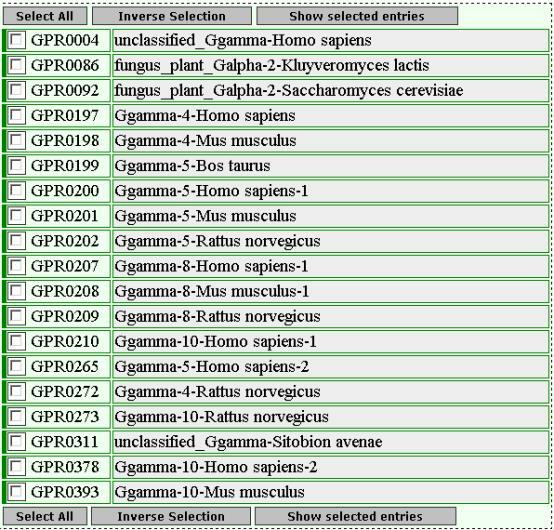 The G-PROTEIN SUBFAMILIES MENU enables the user to either view the protein types of the specific subfamily or to view the coupling specificity of the G-protein subfamily with GPCR subfamilies. Ending up to individual G-proteins. 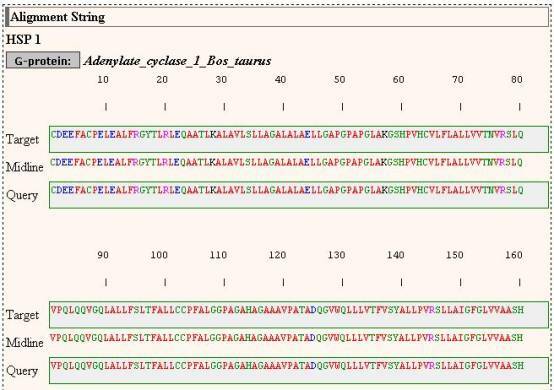 As it is shown in the picture of the G-protein subfamilies the user has the alternative to click on one of the two arrow buttons instead of selecting to click on a specific subfamily. 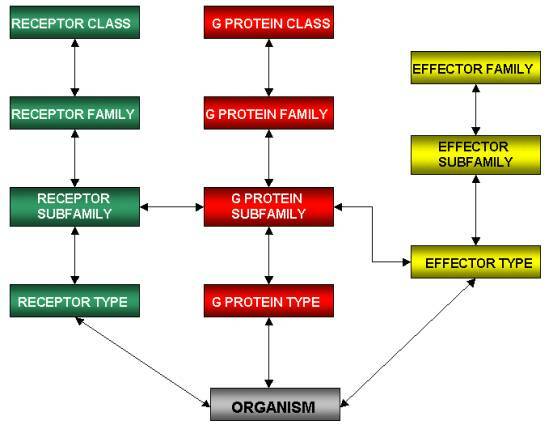 The yellow button presents the user a list of effector types with whom this G-protein subfamily interacts. 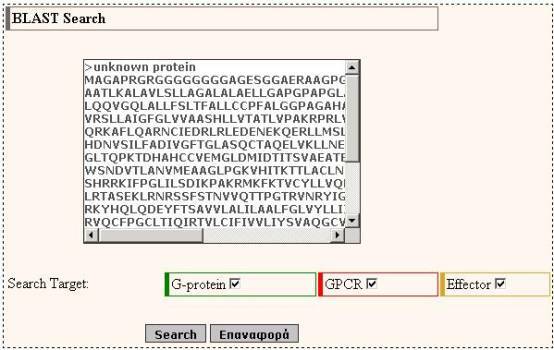 The Effector TYPES MENU enables the user to either view the entries of this protein type or to view the G-protein subfamilies, that interact with this type. Ending up to individual Effectors. As it is shown in the picture of the Effector types the user has the alternative to click on the arrow button instead of selecting to click on a specific type. 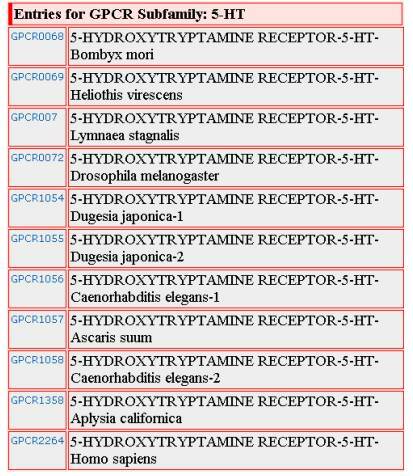 The user then is presented with a list of G-protein subfamilies that interact with this particular Effector type. At each point the user may navigate up or down to the hierarchy tree. In the Text Search area, the user can search for any text in the fields of his/her preference. 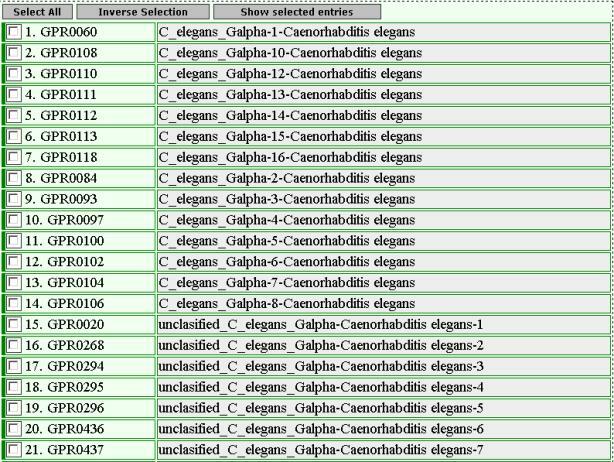 The user can enter any word in one or more of the available boxes under the name: 'Protein Name', 'Species', ’Common Name’, 'Description', 'Gene Name' and 'Cross-References'. The user has also the ability to select if he wants to exclude fragments from the results. Expressions in separate search fields are combined with the AND operator, so every entry of the result set will satisfy the expressions of all the search fields the user has chosen. The user has the option to choose whether the query will be performed against the GPCRs or the G-Proteins included in the database. 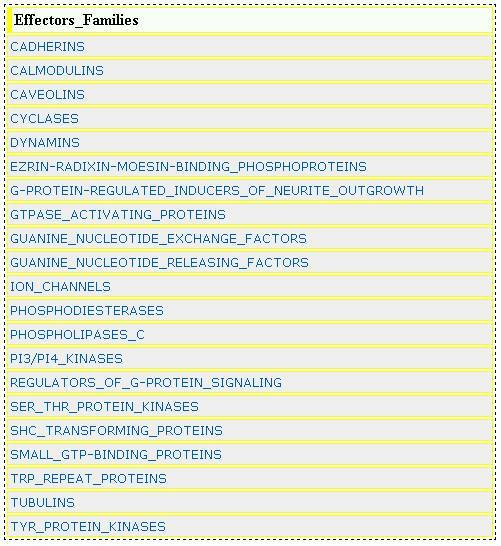 If the user wants to retrieve all Galpha proteins he/she has to use the name “Galpha” as a query in the PROTEIN NAME box and select G-protein from Search Target field. 1) If the user wants to retrieve all G-proteins of Drosophila he/she has to use the name “Drosophila” as a query in the SPECIES box and select G-protein from Search Target field. 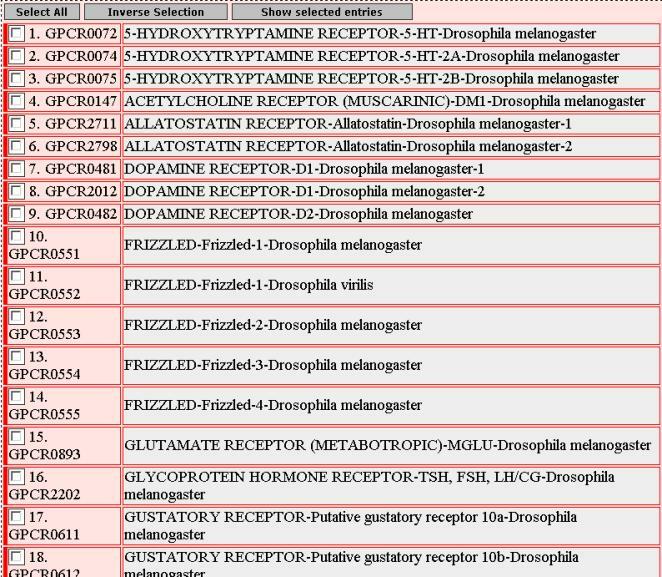 2) If the user wants to retrieve all GPCRs of Drosophila he/she has to use the name “Drosophila” as a query in the SPECIES box and select GPCR from Search Target field. 3) If the user wants to retrieve all G-proteins of Drosophila melanogaster he/she has the alternative to use the name “fruit fly” (The common name of Drosophila melanogaster) as a query in the COMMON NAME box and select G-protein from Search Target field. 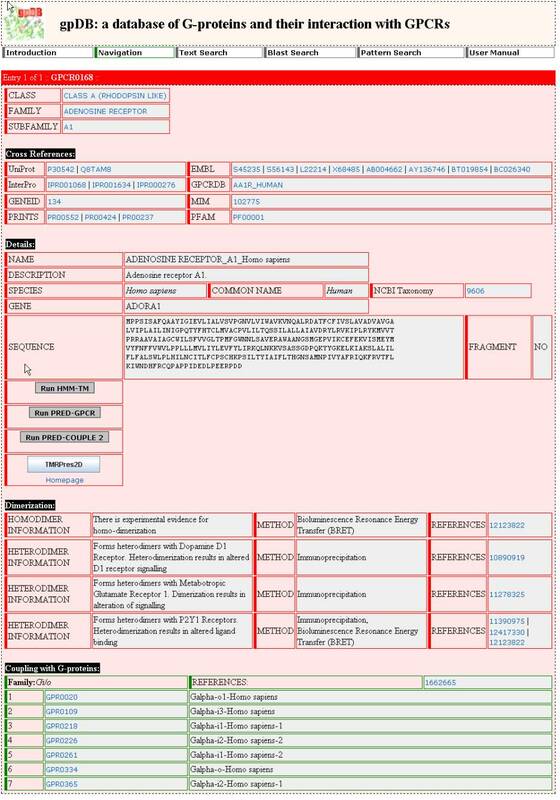 The user is able to use any accession numbers and/or IDs from other databases such as SWISS_PROT, PIR, MIM, PRODOM, GENEW, PRINTS, INTERPRO etc. If the user wants to retrieve a G-protein that has “P29348” as an accession number in SWISS_PROT he has to use “P29348” as a query and select G-protein from Search Target field. 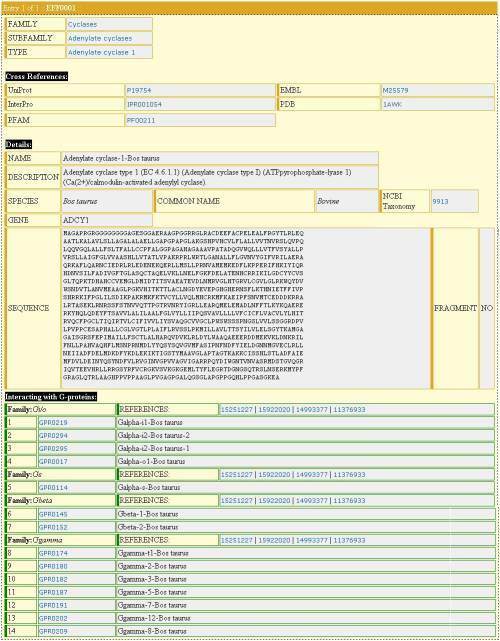 With the BLAST search tool, the user may submit a sequence and search the database for finding homologues. The user has the option to choose whether to perform the BLAST search against GPCRs sequences, G-proteins sequences and/or Effectors sequences. The input for the BLAST application is the sequence in standard FASTA format. The output of the BLAST query consists of a list of sequences in the database having significant E-values in a local pairwise alignment, ranked by statistical significance. In the output, are also listed the range of residues in which the alignment occurs, in both the target and the query sequence, the number of identical and similar residues in the alignment and the E-value of the alignment. And from there, the user may retrieve the detailed view of the entry corresponding to the particular target sequence. 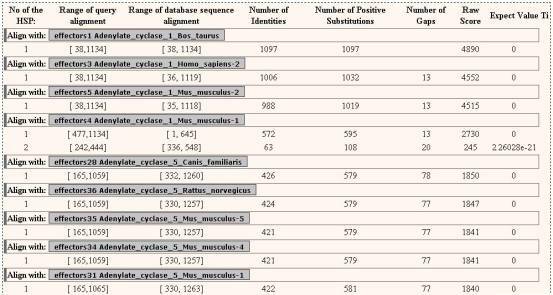 Using the Pattern Search tool, the user may perform searches for finding specific patterns in the proteins of the database. 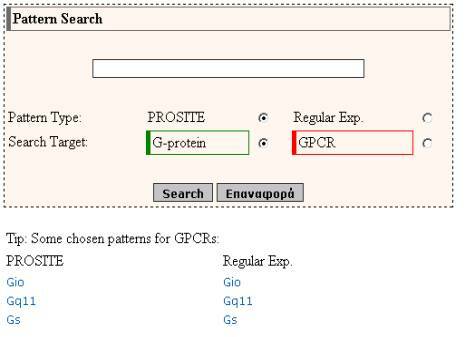 The user has the option to choose whether to perform the Pattern search against the GPCRs sequences or the G-Proteins. The input of the Pattern Search tool is a regular expression pattern following the PROSITE syntax. 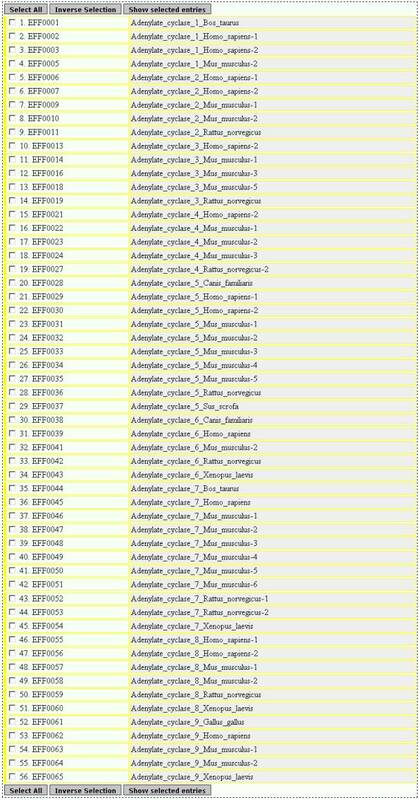 The output of the Pattern search application consists of a list of the sequences matching the particular pattern. gpDB ID(s) and the NAME of the target sequence(s) are listed in the output. The user has the option to check the entry or the entries that he/she wants to retrieve, and after pressing the appropriate button, to have them in the detailed view. The detailed view of an entry corresponds to the last level of the hierarchy. In the detailed view, the available information regarding a GPCR, a G-protein or an Effector sequence is presented. Finally and more important, there is a list with the available information regarding the coupling specificity between GPCRs and G-proteins and/or the interaction between G-proteins and Effectors. PRED-GPCR, PRED-COUPLE2 and HMM-TM are tools that were developed in our laboratory. PRED-GPCR is a system based on a probabilistic method that uses family specific profile HMMs in order to determine to which GPCR family a query sequence belongs or resembles. PRED-COUPLE2 is a system based on a refined library of highly-discriminative Hidden Markov Models in order to predict the coupling specificty of GPCRs to all families of G-proteins (including G12/13). Hits from individual profiles are combined by a feed-forward Artificial Neural Network to produce the final output. HMM-TM is an algorithm for the prediction of the topology of transmembrane proteins using HMMs. 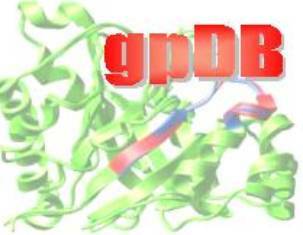 The gpDB accession numbers and the names of the proteins with which that protein couples, are listed with the appropriate links. By clicking on any of these links, the user will be presented with the detailed view of the corresponding protein. Complete entry of A1 Adenosine receptor of Homo sapiens.